When I started looking for drapes for the room - I knew what I wanted. 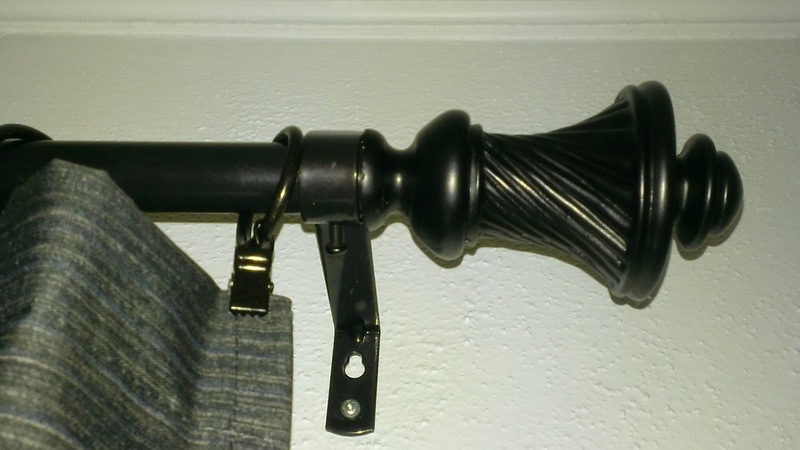 I wanted long insulated drapes with pretty rods. I wanted drapes with the rings in the material so that the drape would slide nicely on the rods. I looked and looked for drapes - the cost was astronomical! $25 to $70 a panel. That was not what I was looking to spend. 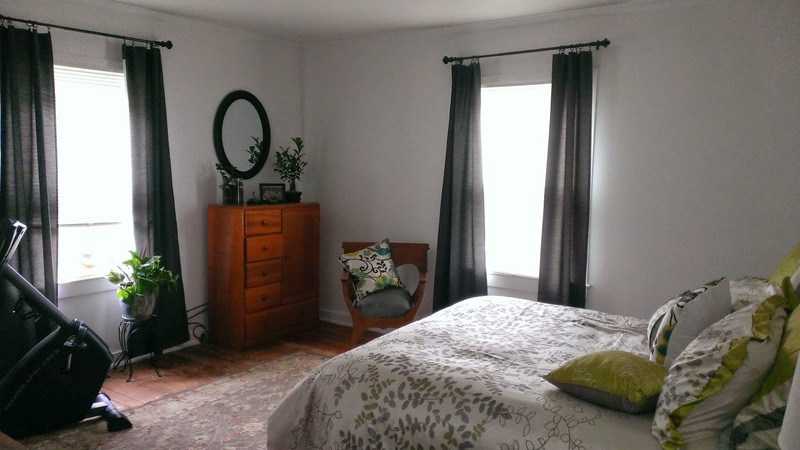 My goal was total $50 or less per window - I wanted rods, drapes, and blind all for $50 or less. I know crazy goal but I wanted to show that I could redecorate on a budget. I did not want to sacrifice thermal drapes..we live in Wisconsin and last winter I think our average temp was -20 degrees. It was so cold! To be able to close window drapes and keep some cold out is a must! 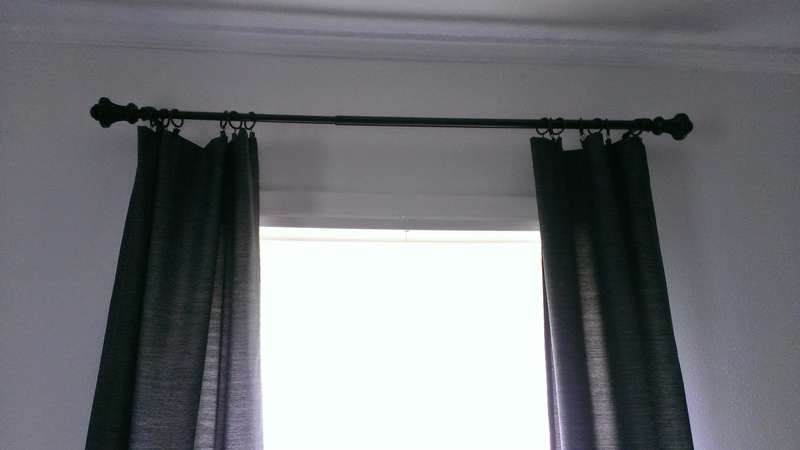 I did not want to sacrifice the rings to make the drapes open and close so easy. 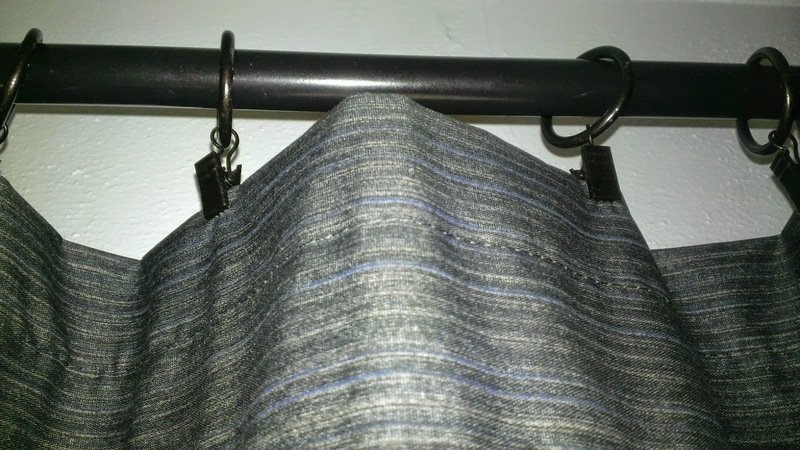 I really dislike curtains when the rod goes through the open seam. During one of my trips to Big Lots I found these really nice thermal drapes in the perfect color (they are black - gray - tad bit of blue & green tones). They were only $14.00 a pair - I needed two pair - total cost $28.00. The big issue was that they did not have the rings in the material the rod would have to go through the seam. I decided to buy the curtains anyway...thinking they are such a deal - I love the color and the texture of the drape. I felt I could not pass them up considering the price.I also found very pretty dark colored rods for the room for only $9.00 each at Big Lots - 2 rods - $18.00. While shopping for rings I checked out the blinds. They carried the standard size - 35x64 - cost $3.97. I was going to get metal blinds but for $3.97 I figured why not! So I purchased the two new blinds. Super excited that I was able to get the look I wanted for only $41.00 a window! I think they look fantastic for that price - no one would ever know how inexpensive they are! Total cost of complete window treatments $82.00 - Not bad!! The windows look great and I love that it can be done on a budget! Blinds and drapes can be sooo expensive! You did a great job and I will for sure be keeping these ideas in my head for later on! I do like your thermal drapes. Great deal on the blinds. Love the drapes and rods! I know we love thermal drapes in our living room over the large windows.